In part five of the 8-part South Ridge Line series, Dean Freytag offers a step-by-step tutorial on how to create industrial vents like the ones found on his American steel industry themed model railroad. Dean came up with the clever idea to repurpose the caps from the air freshener bottles his wife used to buy. 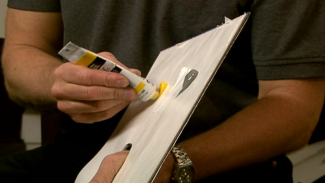 To make the vent, Dean adds a base of out styrene to the cap and puts a nut, bolt and washer around it. He also uses a teddy bear eye from the craft store and inserts it inside the cap. To finish it off, he paints it all the same silver color. Dean suggests going to the craft store to purchase a reasonably priced pipe cutter as well. It will produce a nice curved edge. Dean makes several types of vents in varying sizes. He has come up with a few additional ideas for making vents aside from using a cap. He says wooden plugs used to cover the screw holes in furniture make for good vents as well. You can put a base on them or directly submit them on a roof just like you see them. Dean believes they really dress up a roof when they are painted. Another option for a vent is available from your hardware store. You can use the objects used to protect chair legs as a vent as well. Dean spent a lot of time finding household objects to repurpose for his model railroad. 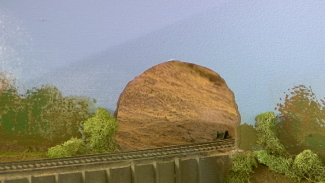 He was very clever in designing the scenery for the South Ridge Line. Now you can use his ideas and techniques for your own modeling.